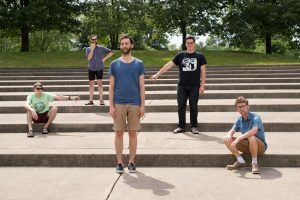 Safety Squad and Radarhill, two of Columbus’ finest up-and-coming jazz ensembles, are joining forces to present a “Winter Wonderland Extravaganza” on Saturday, December 16th at Rumba Cafe. Tickets are $10 at the door and available in advance here. Doors open at 7:30pm, Radarhill plays at 8pm, and Safety Squad follows around 10pm. In the first Columbus appearance for both bands since October, they will both be playing new/rare selections, and both sets will also feature members of the other band for some special new collaborations. In light of this exciting pairing and the fact that the bands are working on new projects, I checked in with Danny Bauer of Safety Squad and Caleb Miller of Radarhill for updates. Keep reading to learn more about what each of the bands are up to and what they’re planning for the show. Does the album have a title yet? DB: No title yet, but one theme I have been working with is the idea of looking at the future. I like reading and learning about robots and artificial intelligence a lot, and some of the song titles reference to things like that. Would you like to share any thoughts on the direction of the new album and new material? DB: So far with all of the new songs, I am happy with everything. I think the biggest challenge to overcome was to not feel pressure to make it ‘better’ than the first album. Putting your writing on a pedestal like that is dangerous and can lead to a mindset where you never feel like what you write is good. Have you observed any differences from the debut album?